For the academic journal, see Diacritics (journal). The main use of diacritical marks in the Latin script is to change the sound-values of the letters to which they are added. Examples are the diaereses in the borrowed French words naïve and Noël, which show that the vowel with the diaeresis mark is pronounced separately from the preceding vowel; the acute and grave accents, which can indicate that a final vowel is to be pronounced, as in saké and poetic breathèd; and the cedilla under the "c" in the borrowed French word façade, which shows it is pronounced /s/ rather than /k/. In other Latin-script alphabets, they may distinguish between homonyms, such as the French là ("there") versus la ("the") that are both pronounced /la/. In Gaelic type, a dot over a consonant indicates lenition of the consonant in question. In other alphabetic systems, diacritical marks may perform other functions. Vowel pointing systems, namely the Arabic harakat ( ـِ ,ـُ ,ـَ, etc.) and the Hebrew niqqud ( ַ◌, ֶ◌, ִ◌, ֹ◌, ֻ◌, etc.) systems, indicate vowels that are not conveyed by the basic alphabet. The Indic virama ( ् etc.) and the Arabic sukūn ( ـْـ‎ ) mark the absence of vowels. Cantillation marks indicate prosody. Other uses include the Early Cyrillic titlo stroke ( ◌҃ ) and the Hebrew gershayim ( ״‎ ), which, respectively, mark abbreviations or acronyms, and Greek diacritical marks, which showed that letters of the alphabet were being used as numerals. In the Hanyu Pinyin official romanization system for Chinese, diacritics are used to mark the tones of the syllables in which the marked vowels occur. In orthography and collation, a letter modified by a diacritic may be treated either as a new, distinct letter or as a letter–diacritic combination. This varies from language to language, and may vary from case to case within a language. English is the only major modern European language requiring no diacritics for native words (although a diaeresis may be used in words such as "coöperation"). In some cases, letters are used as "in-line diacritics", with the same function as ancillary glyphs, in that they modify the sound of the letter preceding them, as in the case of the "h" in the English pronunciation of "sh" and "th". The diacritics >〮 and 〯 , known as Bangjeom (방점;傍點), were used to mark pitch accents in Hangul for Middle Korean. They were written to the left of a syllable in vertical writing and above a syllable in horizontal writing. The South Korean government officially revised the romanization of the Korean language in July 2000 to eliminate diacritics. Devanagari script's (from Brahmic family) compound letters, which are vowels combined with consonants, have diacritics. Here क is shown with vowel diacritics. A semicircle under Peh represents an [f] sound, transliterated as f or ph. In addition to the above vowel marks, transliteration of Syriac sometimes includes ə, e̊ or superscript e (or often nothing at all) to represent an original Aramaic schwa that became lost later on at some point in the development of Syriac. Some transliteration schemes find its inclusion necessary for showing spirantization or for historical reasons. Unified Canadian Aboriginal Syllabics use several types of diacritics, including the diacritics with alphabetic properties known as Medials and Finals. Although long vowels originally were indicated with a negative line through the Syllabic glyphs, making the glyph appear broken, in the modern forms, a dot above is used to indicate vowel length. In some of the styles, a ring above indicates a long vowel with a [j] off-glide. Another diacritic, the "inner ring" is placed at the glyph's head to modify [p] to [f] and [t] to [θ]. Medials such as the "w-dot" placed next to the Syllabics glyph indicates a [w] being placed between the syllable onset consonant and the nucleus vowel. Finals indicate the syllable coda consonant; some of the syllable coda consonants in word medial positions, such as with the "h-tick", indicate the fortification of the consonant in the syllable following it. The Japanese hiragana and katakana syllabaries use the dakuten (◌゛) and handakuten (◌゜) (in Japanese: 濁点 and 半濁点) symbols, also known as nigori (濁 "muddying") or ten-ten (点々 "dot dot") and maru (丸 "circle"), to indicate voiced consonants or other phonetic changes. Modern computer technology was developed mostly in English-speaking countries, so data formats, keyboard layouts, etc. were developed with a bias favoring English, a language with an alphabet without diacritical marks. This has led some to theorize that the marks and accents may be made obsolete to facilitate the worldwide exchange of data. Efforts have been made to create internationalized domain names that further extend the English alphabet (e.g., "pokémon.com"). In modern Microsoft Windows and Linux operating systems, the keyboard layouts US International and UK International feature dead keys that allow one to type Latin letters with the acute, grave, circumflex, diæresis, tilde, and cedilla found in Western European languages (specifically, those combinations found in the ISO Latin-1 character set) directly: ¨ + e gives ë, ~ + o gives õ, etc. On Apple Macintosh computers, there are keyboard shortcuts for the most common diacritics; Option-e followed by a vowel places an acute accent, Option-u followed by a vowel gives an umlaut, Option-c gives a cedilla, etc. Diacritics can be composed in most X Window System keyboard layouts, as well as other operating systems, such as Microsoft Windows, using additional software. Lithuanian. In general usage, where letters appear with the caron (č, š and ž), they are considered as separate letters from c, s or z and collated separately; letters with the ogonek (ą, ę, į and ų), the macron (ū) and the superdot (ė) are considered as separate letters as well, but not given a unique collation order. Irish uses only acute accents to mark long vowels, following the 1948 spelling reform. Breton does not have a single orthography (spelling system), but uses diacritics for a number of purposes. The diaresis is used to mark that two vowels are pronounced separately and not as a diphthong/digraph. The circumflex is used to mark long vowels, but usually only when the vowel length is not predictable by phonology. Nasalization of vowels may be marked with a tilde, or following the vowel with the letter <ñ>. The plural suffix -où is used as a unified spelling to represent a suffix with a number of pronunciations in different dialects, and to distinguish this suffix from the digraph <ou> which is pronounced as /u:/. An apostrophe is used to distinguish c'h, pronounced /x/ as the digraph <ch> is used in other Celtic languages, from the French-influenced digraph ch, pronounced /ʃ/. The Cyrillic Ukrainian alphabet has the letters ґ, й and ї. Ukrainian Latynka has many more. In Bulgarian and Macedonian the possessive pronoun ѝ (ì, "her") is spelled with a grave accent in order to distinguish it from the conjunction и (i, "and"). Hungarian uses the umlaut, the acute and double acute accent (unique to Hungarian): (ö, ü), (á, é, í, ó, ú) and (ő, ű). The acute accent indicates the long form of a vowel (in case of i/í, o/ó, u/ú) while the double acute performs the same function for ö and ü. The acute accent can also indicate a different sound (more open, like in case of a/á, e/é). Both long and short forms of the vowels are listed separately in the Hungarian alphabet, but members of the pairs a/á, e/é, i/í, o/ó, ö/ő, u/ú and ü/ű are collated in dictionaries as the same letter. Faroese uses acutes and other special letters. All are considered separate letters and have their own place in the alphabet: á, í, ó, ú, ý and ø.
Danish and Norwegian use additional characters like the o-slash ø and the a-overring å. These letters come after z and æ in the order ø, å. Historically, the å has developed from a ligature by writing a small superscript a over a lowercase a; if an å character is unavailable, some Scandinavian languages allow the substitution of a doubled a. The Scandinavian languages collate these letters after z, but have different collation standards. Swedish uses a-diaeresis (ä) and o-diaeresis (ö) in the place of ash (æ) and slashed o (ø) in addition to the a-overring (å). Historically, the diaeresis for the Swedish letters ä and ö, like the German umlaut, developed from a small Gothic e written above the letters. These letters are collated after z, in the order å, ä, ö. The Bosnian, Croatian, and Serbian Latin alphabets have the symbols č, ć, đ, š and ž, which are considered separate letters and are listed as such in dictionaries and other contexts in which words are listed according to alphabetical order. They also have one digraph including a diacritic, dž, which is also alphabetized independently, and follows d and precedes đ in the alphabetical order. The Serbian Cyrillic alphabet has no diacritics, instead it has a grapheme (glyph) for every letter of its Latin counterpart (including Latin letters with diacritics and the digraphs dž, lj and nj). Polish has the following letters: ą ć ę ł ń ó ś ź ż. These are considered to be separate letters: each of them is placed in the alphabet immediately after its Latin counterpart (e.g. ą between a and b), ź and ż are placed after z in that order. The basic Slovenian alphabet has the symbols č, š, and ž, which are considered separate letters and are listed as such in dictionaries and other contexts in which words are listed according to alphabetical order. Letters with a caron are placed right after the letters as written without the diacritic. The letter đ may be used in non-transliterated foreign words, particularly names, and is placed after č and before d.
Classical Malay uses some diacritics such as â, ā, é, ḥ, ñ, ô, ṣ, û. Uses of diacritics was continued until 19th century. The Syriac Latin alphabet uses the altered letters of Ā, Č, Ḏ, Ē, Ë, Ġ, Ḥ, Ō, Š, Ṣ, Ṭ, Ū, Ž alongside the 26 standard Latin alphabet symbols. English is one of the few European languages that does not have many words that contain diacritical marks. Exceptions are unassimilated foreign loanwords, including borrowings from French and, increasingly, Spanish; however, the diacritic is also sometimes omitted from such words. Loanwords that frequently appear with the diacritic in English include café, résumé or resumé (a usage that helps distinguish it from the verb resume), soufflé, and naïveté (see English terms with diacritical marks). In older practice (and even among some orthographically conservative modern writers) one may see examples such as élite, mêlée and rôle. English speakers and writers once used the diaeresis more often than now in words such as coöperation (from Fr. coopération), zoölogy (from Grk. zoologia), and seeër (now more commonly see-er or simply seer) as a way of indicating that adjacent vowels belonged to separate syllables, but this practice has become far less common. The New Yorker magazine is a major publication that continues to use the diaresis in place of a dash for clarity and economy of space. A few English words, out of context, can only be distinguished from others by a diacritic or modified letter, including exposé, lamé, maté, öre, øre, pâté, and rosé'. The same is true of résumé, alternately resumé, but nevertheless it is regularly spelled resume. In a few words, diacritics that did not exist in the original have been added for disambiguation, as in maté (from Sp. and Port. mate), saké (the standard Romanization of the Japanese has no accent mark), and Malé (from Dhivehi މާލެ), to clearly distinguish them from the English words "mate", "sake", and "male". In certain personal names such as Renée and Zoë, often two spellings exist, and the preference will be known only to those close to the person themselves. Even when the name of a person is spelled with a diacritic, like Charlotte Brontë, this may be dropped in English language articles and even official documents such as passports either due to carelessness, the typist not knowing how to enter letters with diacritical marks, or for technical reasons - California, for example, does not allow names with diacritics as the computer system cannot process such characters. They also appear in some worldwide company names and/or trademarks such as Nestlé or Citroën. Some orthographies of Cornish such as Kernowek Standard and Unified Cornish use diacritics, while others such as Kernewek Kemmyn and the Standard Written Form do not (or only use them optionally in teaching materials). Filipino has the following composite characters: á, à, â, é, è, ê, í, ì, î, ó, ò, ô, ú, ù, û. The actual use of diacritics for Filipino is, however, uncommon, meant only to distinguish between homonyms with different stresses and meanings that either occur near each other in a text or to aid the reader in ascertaining its otherwise ambiguous meaning. The letter eñe is due to the Spanish alphabet and too, is considered a separate letter. 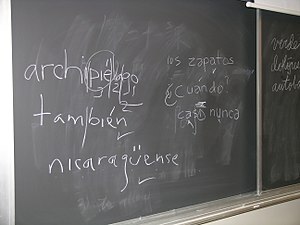 The diacritics appears in Spanish loanwords and names if Spanish orthography is observed. Galician vowels can bear an acute (á, é, í, ó, ú) to indicate stress or difference between two otherwise same written words (é, 'is' vs. e, 'and'), but the diaeresis (trema) is only used with ï and ü to show two separate vowel sounds in pronunciation. Only in foreign words may Galician use other diacritics such as ç (common during the Middle Ages), ê, or à.
German uses the three umlauted characters ä, ö and ü. These diacritics indicate vowel changes. For instance, the word Ofen [ˈoːfən] "oven" has the plural Öfen [ˈøːfən]. The mark originated as a superscript e; a handwritten blackletter e resembles two parallel vertical lines, like a diaeresis. Due to this history, "ä", "ö" and "ü" can be written as "ae", "oe" and "ue" respectively, if the umlaut letters are not available. Maori makes use of macrons to mark long vowels. Occitan has the following composite characters: á, à, ç, é, è, í, ï, ó, ò, ú, ü, n·h, s·h. The acute and the grave indicate stress and vowel height, the cedilla marks the result of a historical palatalization, the diaeresis indicates either a hiatus, or that the letter u is pronounced when the graphemes gü, qü are followed by e or i, and the interpunct (·) distinguishes the different values of nh/n·h and sh/s·h (i.e., that the letters are supposed to be pronounced separately, not combined into "ny" and "sh"). Spanish uses the acute and the diaeresis. The acute is used on a vowel in a stressed syllable in words with irregular stress patterns. It can also be used to "break up" a diphthong as in tío (pronounced [ˈti.o], rather than [ˈtjo] as it would be without the accent). Moreover, the acute can be used to distinguish words that otherwise are spelled alike, such as si ("if") and sí ("yes"), and also to distinguish interrogative and exclamatory pronouns from homophones with a different grammatical function, such as donde/¿dónde? ("where"/"where?") or como/¿cómo? ("as"/"how?"). The acute may also used be used to avoid typographical ambiguity, as in 1 ó 2 ("1 or 2"; without the acute this might be interpreted as "1 0 2". The diaeresis is used only over u (ü) for it to be pronounced [w] in the combinations gue and gui, where u is normally silent, for example ambigüedad. In poetry, the diaeresis may be used on i and u as a way to force a hiatus. As foreshadowed above, in nasal ñ the tilde (squiggle) is not considered a diacritic sign at all, but a composite part of a distinct glyph, with its own chapter in the dictionary: a glyph that denotes the 15th letter of the Spanish alphabet. Tamil does not have any diacritics in itself, but uses the Arabic numerals 2, 3 and 4 as diacritics to represent aspirated, voiced, and voiced-aspirated consonants when Tamil script is used to write long passages in Sanskrit. Romanized Japanese (Romaji) occasionally uses macrons to mark long vowels. The Hepburn romanization system uses macrons to mark long vowels, and the Kunrei-shiki and Nihon-shiki systems use a circumflex. Possibly the greatest number of combining diacritics required to compose a valid character in any Unicode language is 8, for the "well-known grapheme cluster in Tibetan and Ranjana scripts",ཧྐྵྨླྺྼྻྂ, or HAKṢHMALAWARAYAṀ. TIBETAN LETTER HA + TIBETAN SUBJOINED LETTER KA + TIBETAN SUBJOINED LETTER SSA + TIBETAN SUBJOINED LETTER MA + TIBETAN SUBJOINED LETTER LA + TIBETAN SUBJOINED LETTER FIXED-FORM WA + TIBETAN SUBJOINED LETTER FIXED-FORM RA + TIBETAN SUBJOINED LETTER FIXED-FORM YA + TIBETAN SIGN NYI ZLA NAA DA. Some users have explored the limits of rendering in web browsers and other software by "decorating" words with multiple nonsensical diacritics per character. The result is called "Zalgo text". The composed bogus characters and words can be copied and pasted normally via the system clipboard. ^ "The New Yorker's odd mark — the diaeresis". archive.org. 16 December 2010. ^ Nestle, Eberhard (1888). Syrische Grammatik mit Litteratur, Chrestomathie und Glossar. Berlin: H. Reuther's Verlagsbuchhandlung. [translated to English as Syriac grammar with bibliography, chrestomathy and glossary, by R. S. Kennedy. London: Williams & Norgate 1889]. ^ Coakley, J. F. (2002). Robinson's Paradigms and Exercises in Syriac Grammar (5th ed.). Oxford University Press. ISBN 978-0-19-926129-1. ^ Michaelis, Ioannis Davidis (1784). Grammatica Syriaca. ^ Norris, Mary. "The Curse of the Diaeresis". The New Yorker. Retrieved 18 April 2014. ^ van Geloven, Sander (2012). Diakritische tekens in het Nederlands (in Dutch). Utrecht: Hellebaard. Archived from the original on 2013-10-29.